Messa da Reqiuem is the latest work by Mro Mark Agius. 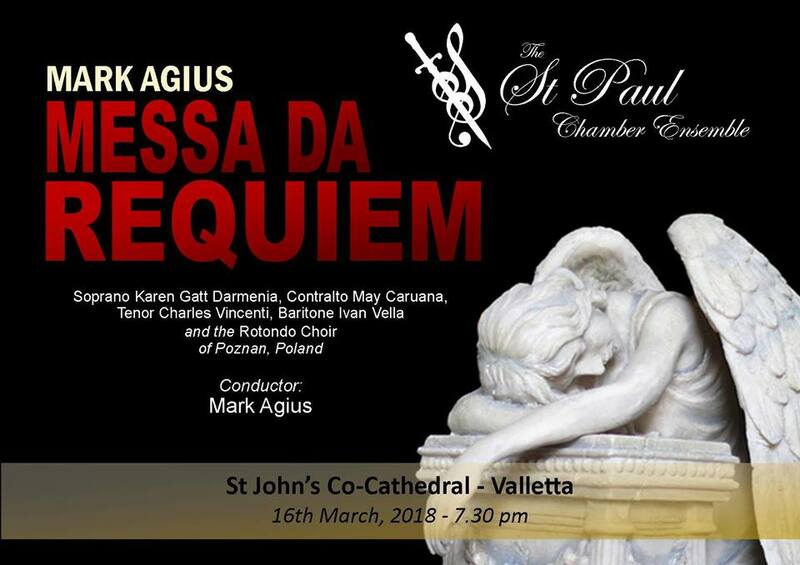 This work will be premiered on the 16th March 2018, at St John’s Co Cathedral by the St Paul Chamber Ensemble, one of Malta’s finest orchestras, bringing together forty-five of the most talented musicians our island has to offer in a concert programme of the highest calibre. The Messa Da Requiem is a work in eight movements, these being the Introit, Kyrie, Sequence (Dies Irae, which is itself divided into a further eight movements), Sanctus, Agnus Dei, Pie Jesu, Libera Me and In Paradisium, and is scored for orchestra, four soloists, and SATB choir. The soloists will be Karen Gatt Darmenia (Soprano), May Caruana (Controalto), Charles Vincenti (Tenor) and Ivan Vella (Baritone) together with the Rotondo choir of Poznan, Poland. What is the aim behind this project? The aim behind the project is twofold. Primarily it is to promote Maltese talent whilst creating a cross-cultural experience through collaboration with one of Poznan’s finest choirs and offering this cultural experience to the general public. Secondly, as one knows, Id-Dar tal-Providenza relies to a very large extent on the generosity of its benefactors and the public donations it receives to live up to its mission. Entrance tickets are being sold at the reasonable price of 10 euro whereby all proceeds will be donated towards Id-Dar tal-Providenza.